The 37.2 metre motor yacht Talos, listed for sale by Paul Daubner at Northrop & Johnson, has been sold with Alexander Marine introducing the buyer. Formerly known as Shogun, she was built in aluminium by US yard Flagship to a design by Jon Overing and was delivered in 1993 with refits in 2005 and most recently in 2014. Accommodation is for eight guests including an on-deck master suite with a king sized bed and a spa tub, a full beam VIP suite and two doubles with king sized beds, all with entertainment centres, television screens and full en suite bathroom facilities. Talos offers a lavish interior with rich fabrics and exotic woods along with custom furniture designed with comfort in mind. She boasts plenty of interior and exterior social areas including a main saloon with dining area, a sky lounge and a large aft deck and sun deck ideal for outdoor entertaining and dining. 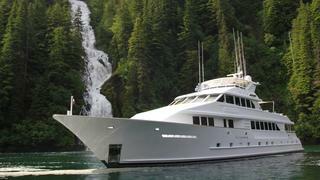 Twin 1,400hp Caterpillar engines give her a cruising speed of 12 knots and a range of 3,685 nautical miles.